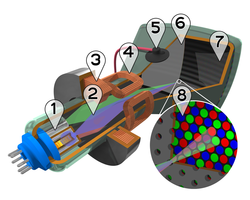 A cathode ray tube is a Visual Display Unit. You might know them as the old 'fat' televisions and monitors that have mostly been superseded by LCD screens. 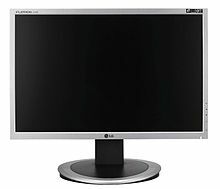 A 19-inch LG flat-panel LCD monitor. To change the image displayed on the screen will require different combinations of Red, Green and Blue pixels. To do this the pixels are sandwiched between two polarized grills. These grills are controlled by an electric current and when current is applied, the grids go perpendicular to each other, blocking out all light from a particular colour. An LCD screen is made up by an array of pixels, each pixel contains Red Green and Blue and there is a back light that shines through the pixel, creating an image. The pixels are sandwiched between two polarized grills. Dot matrix printers use a print head containing a line of pins. The number of pins can vary from 7 into the dozens. As the print head passes over the paper the pins impact on the ink ribbon forming characters on the paper line by line. Inkjets are examples of non-impact printer. They operate by propelling variably-sized droplets of liquid or molten material (ink) onto almost any sized page. They are the most common type of computer printer used by consumers. The paper is then put through heated rollers which melts the toner and seals it to the paper, thus finishing the image. Plotters were an alternate printing technology once common in engineering and architectural firms. Pen-based plotters rely on contact with the paper, but not impact, per se, and special purpose pens that are mechanically run over the paper to create text and images. They were particularly adept to printing vector graphics, though they have generally been replaced with wide-format conventional inkjet/laser printers. Paper is placed in the plotter. the arm then moves the pen to the area where printing needs to start. the pen is lowered onto the paper and the arm moves it drawing a continuous image. Many 3D printers work by heating up a filament of coloured plastic, fed from a spool. As the plastic cools it builds the model from the base up. There are also 3D printers which work with resin, powder, or paper. There are medical applications which build prosthetics and even much larger printers which use concrete for building. What printing device is best for printing thousands of leaflets to advertise a shop opening? Why? The paper is then put through heated rollers which then melts the toner and seals it to the paper, thus finishing the image. When might you want to use an impact printer over an inkjet printer? When might you want to use an inkjet printer over an impact printer? This page was last edited on 25 March 2019, at 15:24.